اسکوئی, بهروز, الماسی, مهدی, صداقت, بی بی رابعه. (1395). مدل‌سازی و وارون‌سازی فشرده دوبعدی داده‌های مغناطیسی منطقه سیاه‏لت همراه با کاربست روش ماسک سیگنال. مجله ژئوفیزیک ایران, 10(2), 15-24. بهروز اسکوئی; مهدی الماسی; بی بی رابعه صداقت. "مدل‌سازی و وارون‌سازی فشرده دوبعدی داده‌های مغناطیسی منطقه سیاه‏لت همراه با کاربست روش ماسک سیگنال". 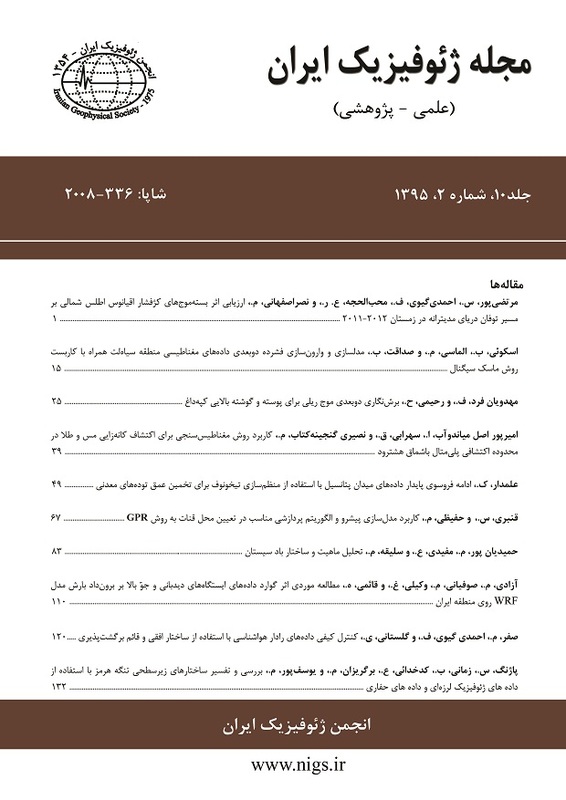 مجله ژئوفیزیک ایران, 10, 2, 1395, 15-24. اسکوئی, بهروز, الماسی, مهدی, صداقت, بی بی رابعه. (1395). 'مدل‌سازی و وارون‌سازی فشرده دوبعدی داده‌های مغناطیسی منطقه سیاه‏لت همراه با کاربست روش ماسک سیگنال', مجله ژئوفیزیک ایران, 10(2), pp. 15-24. اسکوئی, بهروز, الماسی, مهدی, صداقت, بی بی رابعه. مدل‌سازی و وارون‌سازی فشرده دوبعدی داده‌های مغناطیسی منطقه سیاه‏لت همراه با کاربست روش ماسک سیگنال. مجله ژئوفیزیک ایران, 1395; 10(2): 15-24. در این مقاله به مطالعه مغناطیسی منطقه سیاه‌لت به‌منظور اکتشاف کانسار آهن پرداخته می‌شود. در این مطالعه علاوه‌بر روش‌های رایج در تفسیر کمّی و کیفی که در اکتشافات ژئومغناطیسی رایج است، به مدل‌سازی و وارون‌سازی داده‌ها پرداخته می‌شود. در وارون‌سازی داده‌ها روشی که میدان مغناطیسی را با کمینه‌سازی مساحت سطح مقطع توده منشأ مدل‌سازی و وارون‌سازی می‌کند، به‌کار گرفته می‌شود. این روش وارون‌سازی بر پایه الگوریتم کمترین مربعات وزن‌دار عمل می‌کند. در وارون‌سازی داده‌ها همچنین از روش جدید ماسک سیگنال استفاده می‌شود، بدین‌گونه که عملگر وارون‌سازی بر روی قسمت‌هایی از سیگنال به نام سیگنال مفید، اعمال می‌شود. با استفاده از روش ماسک سیگنال اثرات نوفه کاهش می‌یابد و فرایند همگرایی عمدتاً بر روی سیگنال مفید تمرکز پیدا می‌کند. وارون‌سازی داده‌ها بر روی دو پروفیل صورت گرفته است. یکی از این پروفیل‌ها نشان‌دهنده دو بی‌هنجاری شیب‌دار است که یکی از عمق حدود 10 متر تا عمق حدود 30 متر و دیگری از عمق حدود 10 متر تا عمق حدود 20 متر گسترش دارند. این دو بی‌هنجاری مجموعاً دارای طول تقریبی 140 متر و ضخامت 4-3 متر هستند. پروفیل دیگر نشان‌دهنده یک بی‌هنجاری شیب‌دار با طول تقریبی 90 متر و ضخامت 5-4 متر است که تقریباً از سطح زمین شروع شده و تا عمق 25-20 متری گسترش دارد. با توجه به مقدار پذیرفتاری مغناطیسی به‌دست آمده بعد از وارون‌سازی داده‌ها، می‌توان کانسار موجود را به هماتیت نسبت داد. In geomagnetism, we have different methods for estimating the depths and shapes of the magnetic bodies in data interpretation. One of the essential and significant methods to describe the geological complexity of earth’s crust is modeling of magnetic data by inversion. The code of the inversion procedure is based on a least-squares algorithm, according to a criterion of balancing the weight of the data inaccuracies and the compactness of the solution. The interpretation of magnetic data can sometimes involve two steps, calculation of the direct problem (forward modeling) and solution of the inverse problem (inversion). Modeling and inversion of the total magnetic field and its compliance with the basic principle to minimize the cross-sectional area of the source bodies are described. The software code, with an interactive graphical interface, operates in MATLAB environment. The current paper has carried out a geomagnetic study on Siahlat region in order to explore iron ore. In addition to common methods in quantitative and qualitative interpretation in geomagnetic explorations, data modeling and inversion have been used. In data inversion we use a method that models and carries out inversion of the magnetic field through minimizing cross-sectional area of the source bodies. This inversion method works based on a weighted-damped least-squares algorithm. In this method the subsoil is considered to consist of horizontal prisms orthogonal to the survey profile and it is assumed that magnetic properties are constant in every prism. By changing the amount of magnetic susceptibility contrast in each pixel in spatial domain and comparing the calculated data with the observed data, inversion continues until an acceptable fitting between these data is obtained and the difference is minimized. The final answer which has the best fitting is selected as the final cross-section. The studied area is mainly composed of sedimentary rocks. These rocks include carbonate rock, sandstone and quartzite formations that are located in Binder, Zaigun, Lalun and Mila formations. Metamorphic rocks can also be seen in these formations. In the data inversion, the new mask signal method has been used. In fact, some segments of the signal that carry target information are selected quasi-automatically which is called mask signal, that is inversion operator is applied to the signal segments which are called useful signal. The use of mask signal method reduces the effects of noise and the convergence process is mainly focused on the useful signal. The experimental data used are related to an iron ore in Siahlat region in Semnan Province and inversion process has been carried out on two profiles. One of these profiles shows two slope anomalies, one of which is extended from about 10m depth to about 30m depth and the other from about 10m depth to about 20m depth. These two anomalies are in total 140m long and 3–4m thick. The other profile shows a slope anomaly with about 90m length and 4–5m thickness which almost starts from the surface of the ground and extends to the depth of 20–25m. Given the amount of magnetic susceptibility obtained through data inversion, the ore under study can be considered to be hematite. Cooper, G. R. J., and Cowan, D. R., 2006, Enhancing potential field data using filters based on the local phase: Computers & Geosciences, 32(10), 1585–1591. Fedi, M., Primiceri, R., Quarta, T., and Villani, A.V., 2004, Joint application of continuous and discrete wavelet transform on gravity data to identify shallow and deep sources: Geophys. J. Int., 156(1), 7–21. Fedi, M., and Quarta, T., 1998, Wavelet analysis for the regional-residual and local separation of potential field anomalies: Geophysical Prospecting, 46(5), 507–525. Gauss, C. F., 1838, On a new instrument for the direct observation of the changes in the intensity of horizontal portion of the terrestrial magnetic force: Scientific Memoirs, 2(1838), 252–267. Last, B. J., and Kubik, K., 1983, Compact gravity inversion: Geophysics, 48, 713–721. Moreau, F., Gibert, D., Holschneider, M.,and Saracco, G., 1997. Wavelet analysis of potential fields: Inverse Problems, 13, 165–178. Stocco, S., Godio, A., and Sambuelli, L., 2009, Modelling and compact inversion magnetic data: A Matlab code: Computers & Geoscience, 35, 2111–2118.